Decades before the Zinger 1 mission lifted off into the stratosphere (and Rob Lowe sported a spacesuit to play Colonel Sanders), KFC sponsored the "Chix in Space" experiment, which really flew into outer space. A spicy, crispy chicken sandwich riding in an animatronic "bucket satellite," mounted to a steerable platform, is now soaring into the stratosphere carried by a giant helium balloon. The Zinger 1 mission serves as both a shakeout cruise for World View Enterprises' Stratollite high-altitude vehicle and a commercial for Kentucky Fried Chicken's newest menu offering. 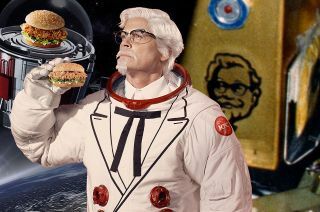 The earlier has applications for science, disaster response and telecommunications; the latter is a fast food marketing campaign complete with Rob Lowe appearing in TV commercials as a spacesuited Colonel Sanders. Despite it being billed by KFC as a "space mission," the Zinger chicken sandwich is about 50 miles (80 kilometers) shy of leaving the atmosphere. The planned four-day flight might set a record for the longest controlled stratospheric balloon flight of a commercial cargo in history, but it is not the first KFC-sponsored space payload. For that, you need to look back three decades. John Vellinger was in the ninth grade in Lafayette, Indiana, when he came up with an idea for a space-based chicken embryo incubator. Egged on by the interest his concept attracted at a NASA-sponsored science fair, Vellinger continued to work on the project through high school, until, as a freshman at Purdue University, the space agency reached out to him with news that a corporate sponsor had taken an interest in flying his experiment. Kentucky Fried Chicken would not only underwrite building a flight-qualified incubator, but would provide its engineer, Mark Deuser, to help Vellinger do it. The experiment, formally referred to by NASA as "Chicken Embryo Development in Space," but affectionately dubbed "Chix In Space," would fly 12 White Leghorn chicken eggs fertilized immediately prior to launch to see if any changes in the developing embryo could be attributed to radiation or microgravity effects. Eight of the eggs would be exposed to weightlessness and radiation in orbit, while the remaining four would have lead shields to minimize their radiation exposure. A dozen eggs would remain on Earth as a control, tended to by Vellinger "much as a mother hen would, turning them five times a day to counter the effects of Earth's gravity on the yolk," as NASA's press release described at the time. A mission patch created for the project featured a yellow cartoon chick wearing a space helmet while riding atop a space shuttle orbiter circling an egg-shaped ringed planet labeled "Kentucky Fried Chicken." At the base of the planet, under its yolk core, was KFC's iconic Colonel Sanders logo. By launch day, Vellinger was a sophomore at Purdue. He had trained STS-51L payload specialist Christa McAuliffe and her Teacher-in-Space backup Barbara Morgan how to operate the "Chix in Space" unit aboard the space shuttle Challenger and he was one of the last people, other than the astronauts themselves, to climb into the orbiter on the launch pad to check on his experiment on Jan. 28, 1986. Tragically, 73 seconds after their launch, McAuliffe and her six crewmates were lost when Challenger broke apart, the result of a cold weather impaired solid rocket booster. In the wake of the disaster, Vellinger returned to Purdue and Deuser resumed developing specialized equipment for KFC restaurants. STS-29 astronaut John Blaha works with the "Chix in Space" egg incubator aboard the space shuttle Discovery in 1989. It was not long though, before Vellinger and Deuser were teamed up again to fly an advanced version of the "Chix in Space" experiment. This time, the incubator would support 32 chicken eggs — 16 fertilized just two days prior to launch and the other 16 fertilized nine days prior — to study if any changes in the developing embryo could be attributed to weightlessness. "I'm very excited to be here," Vellinger told NASA's STS-29 crew at a pre-flight training session. "Imagine this chicken egg in the back of the barnyard. Gravity is causing the yolk to fall down to the bottom of the egg. Now, the hen has a natural instinct of turning that egg around, so therefore the yolk will go back to the top and gravity pulls it back down to the bottom again." "Now, what would happen to that egg up in space when you don't have gravity pulling that yolk back down to the bottom? How would that embryo develop?" Vellinger said, describing the hypothesis that inspired the "Chix in Space" student experiment. The locker-sized flight unit was loaded onto space shuttle Discovery. On the front of the device, which was golden in color, was inscribed, "John Vellinger, Chix in Space," and in the lower right corner was KFC's Colonel Sanders logo. Launched March 13, 1989, the first KFC-sponsored space payload orbited the Earth 80 times, traveling more than 2 million miles (3.2 million kilometers) over the course of five days. It reached a top altitude (aboard the space shuttle) of 185 miles (297 km), 12 times higher than the Zinger 1. The original "Chix in Space" mission patch produced by Kentucky Fried Chicken for the experiment's 1986 launch. Even more exciting than KFC reaching (real) space were the results of the "eggs-periment" (to cite a NASA-quipped pun). Less than a week after Discovery landed, at 8:29 p.m. EST on March 24, 1989, the first space-flown egg hatched. The 1.5 ounce (41.8 g) male chick, named "Kentucky," broke through its shell at KFC's headquarters ("Colonel Sanders Technical Center") in Louisville. "The first space chicken, Kentucky, will be donated to the Louisville Zoo to be put on display," said Gregg Reynolds, then the vice president for public affairs at KFC. The other space chicks hatched would live out their normal lifespan for scientific observation. "This project may yield data [to] help scientists understand the loss of bone mass in astronauts, prospects for human reproduction in space — and chicken's potential as a food source in space,' Vellinger said in 1989. Today, the "Chix in Space" STS-29 flight unit is on display at the Cosmosphere museum in Hutchinson, Kansas. And Vellinger and Deuser are still working together, though no longer with KFC. The two cofounded a Louisville-based company to develop payloads for space-based research. Techshot, Inc. devices flew on later space shuttle missions and today continue to fly on SpaceX's Dragon spacecraft, including supporting NASA's Rodent Research hardware that studies mice on board the International Space Station and partnering on the development of the first zero gravity 3D bioprinter. See more photos of the "Chix in Space" KFC experiment, including how it is displayed at the Cosmosphere, at collectSPACE.